Read the second page of this grow journal. Read the third page of this grow journal. I’ve ordered from online seed guys before and have been burned a couple of times so I’m always cautious and do my due diligence. When I found Bergman’s site, I made a small order to test the company. I got exactly what I ordered. The second order was larger and again my products were delivered perfectly so I recommend them for anything you need. I also know 5 other people that made orders with no problems. Because I’ve been ripped off before, I was a little leery of ordering from a new source, but I’m happy to say the seeds from Bergman just came in, December 8, 2016. They came in the envelope and packaged like shown in the images. I only ordered five seeds so I wouldn’t lose more money if the company turned out to be a scam. I did a crappy upload for the five seed image, and you can’t see the last one. That seed didn’t look quite right. I’ll have to see if it sprouts or not. Note: it has sprouted and growing fine. I use peat rings to germinate my seeds. At one time I would lay out the seeds on a paper towel and keep them moist until they popped, but all that does is add another touch (I like to touch/move plants as little as possible) because you have to put them in something after they sprout. By using the peat rings, once they pop and grow a couple of inches, you can dig out some space in your larger seedling pot and plant the peat ring. The only touch you’ll have is when putting the seed into the ring the first time. The blue thing under the peat rings in the image is a heating pad. I’ve been using heat for a number of years and IMO, it speeds up the germination by a few days. Be sure to check for moisture as the heating pad will dry your peat rings faster. Do not let your seeds dry out during germination. I would love to hear your comments about your experience buying weed seeds online. Use the comment box below. 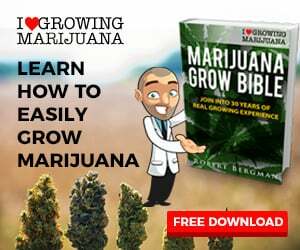 Use it for any questions you may have about growing too. So far, so good. I order 5 seeds, got them in 20 days, immediately placed them in moistened peat rings and within 3 days, they have sprouted. Sprouting in three days is really excellent and in my opinion, using the heating pad under the peat rings is the reason why. It’s simple to do and it will save you at least 3 days if not more. When I didn’t use a heating pad, seeds normally sprouted in around 7 days and many would take even longer. Upon delivery, Thursday, Dec. 8, 2016, I immediately placed the seeds in moistened peat rings. The first photo in the gallery showing them popped was taken three days later on Dec. 11. The second photo was taken 2 days later, on Dec. 13, You can see the seedlings at about one inch tall. The third photo was taken Dec. 15, one full week after seed delivery. You can see the growth is going great and it’s only been 7 full days. I still use the lowest setting on the heating pad, checking continuously through out the day making sure they stay moist. IMO, the best way to keep them moist after they are in the couple inches tall range is using a spray bottle. I give a couple light sprays three or four times per day. I’ll be transplanting them in a little larger pot in another day or two. I’ll start with my soil blend moistened with water mixed with my nutrient blend than spray them a few times each day with plain water for a while. I have well water and don’t have to worry about chlorine. I don’t believe that using nutrients on seedlings or clones hurt the plants. I’ve proved it with dozens of grows. My clone success rate increased from about 60% using plain water to 99% using water with nutrients. Before using nutrients, I wouldn’t even bother using a clone smaller than 6 inches. Now I have success cloning 2-inch stems, and IMO, it’s from early use of nutrients. I strongly suggest for city water users, fill your jugs with water and let them sit so the chlorine dissipates. Thanks for keeping up with this website. The plants are really growing great. All five plants are doing well. I use ProTekt with all my plants for a heartier stem and leaf to make it more difficult for critters to chew the leaves. Since my soil mix was used before and ProTekt affects the PH, I added 1 tbsp of horticulture hydrated lime to a gallon of water to balance it. When I transplant into their final six gal pot, my first watering will include 3/4 tbsp of lime along with the nutrients to balance the PH. After that application, the PH should be okay. As mentioned before, I also use nutrients in the early stage as well as keeping the plants on a heating pad. The proof is in the pudding; look how nice the plants look in the two images. And of course a 100% success rate so far. During this stage of plant growth, after my initial watering with the added lime, 1 tsp of ProTekt and 1 tsp of Foliage Pro, the second watering, I used plain water and I’ll do the same for the third watering. In between watering, I spray the leaves with plain water. NOTE: I have well water. If you are using city water, I strongly suggest keeping gallon jugs full of water on hand to give the chlorine a chance to dissipate before using. These plants will be transplanted into their for-ever home a little after their third watering. I like to transplant when the soil is damp; makes it easier to get the plant out of the smaller pot with out damaging the roots. The plants are growing well, great color, sturdy, upright and not stretching. I attribute this to using a mix of LED lights and CFL’s, heat and nutrients during the early stages of growth. When I transplant them into their 6 gallon permanent home, I’ll use PotPotz Fabric Plastic Pot Liners (more on them later) and I’ll add 1 tbsp of the lime to a gallon of water for the first watering along with nutrients since the soil will be used from a previous grow. This will be the only time I add the lime. I also plan on cloning these plants which is suppose to be very difficult to do. I have to wait to for some secondary stems to start growing and I’m not sure if I’ll know if they’re .are females or males. We’ll see what happens. Keep flowering this post, I mean following. Plants growing very well, little buds are forming; it’s only been 24 days since they sprouted. Majorly disappointed in my 1600 Watt LED light from King. It’s only a year old, and four rows of LED’s, right in the middle of the light are out. I have no idea what happened. I’m kinda handy. Hopefully, I can fix. But I’m pissed. Grow lights should be made to with-stand the workload. All the plants are about 5-1/2″ tall and the stems are really sturdy. In about five more weeks, I’ll probably be able to test a sample. To dry out brand new buds, I use a oil filled space hitter. Click that link for more info but in a nutshell; first I put down a sheet of white copy paper, place my wet buds on top and cover with another sheet of copy paper. To seal the deal, I use a local magazine type newspaper on top of that. You have to watch closely, takes from about 20 to 45 minutes, but this is by far the best way to dry out bud when you’re in a hurry. If you go too long, your weed will be really dry. NOTE: nothing beats natural curing. This page is continued on another page; go here.